RTG Mining Inc. was pleased to be invited as the major and naming sponsor for the festivities on Bougainville Day in Arawa. Bougainville Day is an annual celebration to commemorate the day on which Bougainville was granted autonomous self-government. The celebration is a community event with backing of local business houses and the Kieta District Administration. RTG was proud to be invited as the major sponsor and was happy to support Bougainville and its people on this important day. The Chairman of the Special Mining Lease Osikaiyang Landowners Association, Mr Philip Miriori gave a speech as part of the opening ceremony. 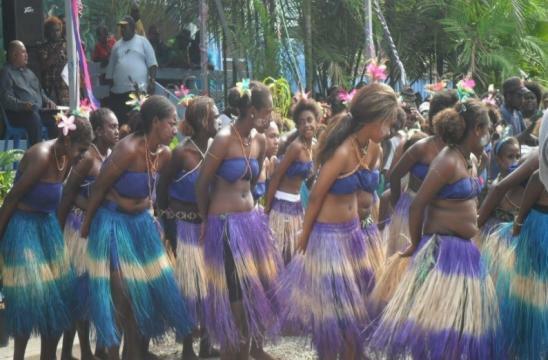 There were special performances and activities throughout the celebration which included the famous beats of the Bougainville Bamboo Band and traditional dancing and singing from the various areas in the region. Local organisations were showcased in Arawa including the Special Mining Lease Osikaiyang Landowners Association who had a stall with information regarding its plans with RTG for Panguna and community projects. RTG is also pleased to report that we have been working with the Bougainville Women’s Federation who participated in the national congress of women representatives from throughout Papua New Guinea and Bougainville, focusing on a customary reconciliation of all groups attending to support a peaceful and successful decision on Independence. The conference has included 21 Provincial Presidents and Executive including the local Regional President, Ms Rachel Tsien, Sub-Regional President Ms Josephine Kauona and Ms Rosemary Moses. The ladies from all of the federations in PNG and Bougainville participated in a reconciliation ceremony recognizing the deaths of husbands, sons and daughters in the Bougainville Crisis and the subsequent suffering the women of PNG and Bougainville have endured. Most of Central Bougainville is a matrilineal society recognising strongly the importance of the women to the family unit, while also being the customary landowners of much of Bougainville, including the Panguna region. RTG’s CEO, Ms Justine Magee took great pleasure in supporting and encouraging these women to ensure they are given a proper forum to express their views, undertake customary reconciliation events and share experiences with their colleagues and friends. Ms Magee participated in the closing ceremony. RTG respects and values the important work these women are doing. We were again honoured to be invited to help and support them in these endeavours and encourage their continued success.